While chatting with my friend Sarah over lunch last Saturday, we discussed many things – including this blog (thanks for the shout-out by the way). After Sarah asked me to never again post disgusting photos of deep-fried tarantulas, she came up with a fantastic idea. Readers, I ask you now: What is your culinary depravity? The thing you know you shouldn’t like, but you enjoy anyway? The item in which you can only indulge when the house is empty and the lights are off? And, since adding a comment to this post effectively negates the whole “anonymous” thing, I want you to send me your confessions via email. Click on the “Ask Wendalicious” link over there on the right, and send me a short and sweet description of your food sins. I want to know what it is, how you like to eat it, if you allow anyone to witness the ingestion, and if you plan on continuing down the garden path to hell. Confess! I’ll post every submission here on the blog, as I receive them, with no identifying marks of any kind. Of course, if you don’t care who is all up in your business, you are more than welcome to leave a comment on this post, baring your naughty soul to all who enter here. 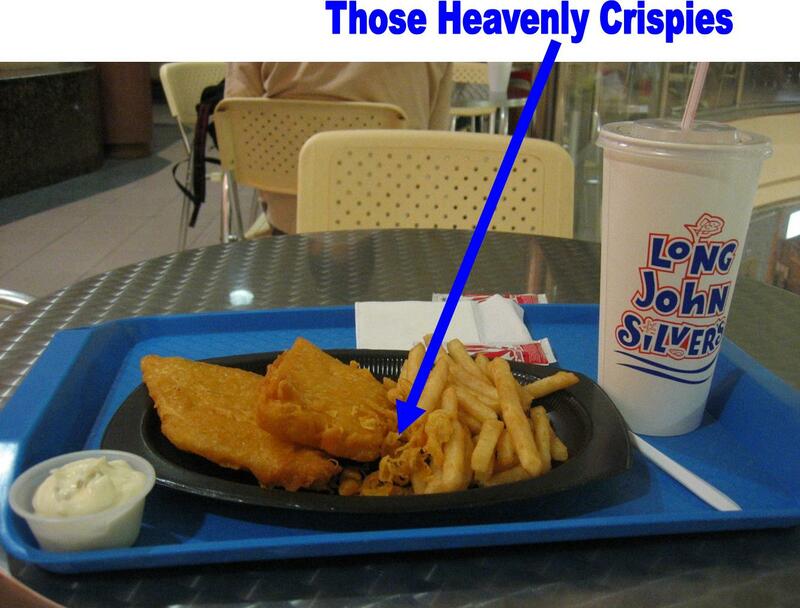 I’ll start: I love Long John Silver’s Fish. Big and greasy, dipped in tons of industrial tartar sauce. Followed by a mouthful of “crispies” – those miscellaneous crumbs of fried batter that got splattered into the oil, and came back up in the Fryalator with the fish. Awful, horrible, nasty, and delectable. I never go to LJS with friends – it’s a solo experience, in which I go through the drive-thru, park in the LJS lot, and surreptitiously devour the fish (and crispies, and hushpuppies), washing it all down with a Diet Pepsi (no need to remind me of what’s wrong with that). Immediately following, I find a nearby trash can and deposit the evidence. That way, no one can witness the horror, and my car doesn’t end up smelling like an Atlantic City pier at noon. Previous Previous post: Wendalicious Photo Contest for June 25 – WINNER! I love chicken skin. I know. It’s gross. Yet oh so good. I’m a recently reformed vegetarian who still tries not to eat industrial meat when I do eat any. I don’t like the oh so popular bland, boring, dry chicken breast. Give me a thigh or a leg with the skin juicy and crispy with a little seasoning and I am in heaven. I’ll do the same with duck or turkey. Without the skin, it just has no flavor. Alas, I have had to give up all my guilty pleasures, but it usesd to be nacho cheese doritos. I would literaly eat most of a bag in a sitting (I would laways leave maybe a handful, so I could say I dodn’t eat the whole bag). I would eat them in front of people, but never as much as I wanted unless I was alone. There’s just something about licking that bright orange powder off my fingers that made me want more. I still love pink bubble gum ice cream from Baskin Robbins and Pepperidge Farm Coconut Layer Cake (from the freezer section of the grocery store)…not together mind you (although as a pregnant lady, that doesn’t sound half bad). And I agree with Marlene too – on the NCD. I’m sure there is more, but that is what immediately comes to mind! As a non-pregnant lady, that combination doesn’t sound half bad. I will take the nacho cheese Doritos a step further. I would eat half a bag (ok, maybe the whole bag) along with a tub of onion dip. Oh so good together. And then washed down with a can of Coke. Not diet, the full strength of sugar and calories. That is my foodie guilty pleasure. I don’t think I have any others. That’s bad enough. Stale Easter peeps (but only in the original yellow or pink)? Sweet tooth? What sweet tooth? Strawberry poptarts rock – got some in my pantry right now! Peeps are a crime against nature. Do you sip the jello juice with a straw? And isn’t it WARM? Oooh…love the preset jello – either peach or raspberry are my favorites!